I think most parents of weaning aged children have heard about Organix. They're an amazing baby food brand that pride themselves on having great taste, with zero junk. They've become a staple in our household, especially since Patrick became dairy intolerant, as Organix have been one of the only brands we've found that use dairy sparingly. Which of course is great for us as it means he gets to enjoy the same treats he always has, and doesn't miss out. Organix have recently partnered up with Chessington World of Adventure, to celebrate their brand new Gruffalo River Ride, to offer little explorers the chance to go completely free. 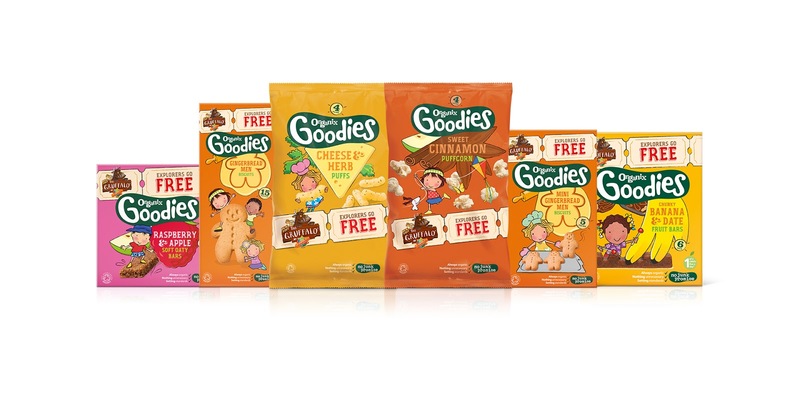 All you have to do is look out for the Gruffalo promotion packs on your favourite Goodies snacks, each multipack contains a voucher which gives one adult or one child free entry to Chessington World of Adventures Resort. An added bonus is that in resort, you can now buy your favourite Organix snacks from a range of outlets and if you look closely, you'll notice they've made their way into the childrens' meal deals - perfect if you're a family like us with smalls in tow, we've often found it difficult in the past to find food outlets in big attractions that cater for the smaller travellers in our group. Organix really are the bee's knee's for us in terms of snacks for our boys, they live up to their no junk promise and I never feel guilty for giving them an extra gingerbread man when I know they're crammed with good stuff. The boys feel as though they're getting treats, and I know there isn't anything sinister inside - win win on the parenting front.